12 When he heard that John had been arrested, he withdrew to Galilee. 13 He left Nazareth and went to live in Capernaum by the sea, in the region of Zebulun and Naphtali, 14 that what had been said through Isaiah the prophet might be fulfilled: 15 “Land of Zebulun and land of Naphtali, the way to the sea, beyond the Jordan, Galilee of the Gentiles, 16 the people who sit in darkness have seen a great light, on those dwelling in a land overshadowed by death light has arisen.” 17 From that time on, Jesus began to preach and say, “Repent, for the kingdom of heaven is at hand.” 18 As he was walking by the Sea of Galilee, he saw two brothers, Simon who is called Peter, and his brother Andrew, casting a net into the sea; they were fishermen. 19 He said to them, “Come after me, and I will make you fishers of men.” 20 At once they left their nets and followed him. 21 He walked along from there and saw two other brothers, James, the son of Zebedee, and his brother John. They were in a boat, with their father Zebedee, mending their nets. He called them, 22 and immediately they left their boat and their father and followed him. 23 He went around all of Galilee, teaching in their synagogues, proclaiming the gospel of the kingdom, and curing every disease and illness among the people. 24 His fame spread to all of Syria, and they brought to him all who were sick with various diseases and racked with pain, those who were possessed, lunatics, and paralytics, and he cured them. 25 And great crowds from Galilee, the Decapolis, Jerusalem, and Judea, and from beyond the Jordan followed him. From the beginning of Matthew’s narrative up through the “temptation” in the dessert (4:1-11) we have been introduced to Jesus of Nazareth, Israel’s Messiah and Son of God. A rich profusion of scriptural quotations and allusions has traced a variety of prophetic themes and connection, which as a whole, point to the coming of Jesus as the time of fulfillment of God’s desire and hopes for his people. Jesus has been marked as the one who will carry the work announced by John the Baptist into the era of judgment and salvation promised from of old by God. It is here in our gospel reading that the stage is now set for the public ministry of Jesus to begin in earnest. Following the arrest of John the Baptist, Jesus begins his own ministry in the territory of Zebulun and Naphtali, in the region of Capernaum. Matthew includes the first of two important markers for the ministry of Jesus by telling us that “From that time on Jesus began to preach …” (4:17). The focus of the Gospel is no longer the identification of Jesus based upon the witness of others, but rather Jesus’ self-revelation in his words, deeds and signs. It is in these things he is revealed as the messenger of the Covenant, the King who declared that the kingdom of heaven was breaking into the experience of men and women. This entry was posted in Catholic, Scripture and tagged disciples, fishers of men, Matthew by Friar Musings. Bookmark the permalink. 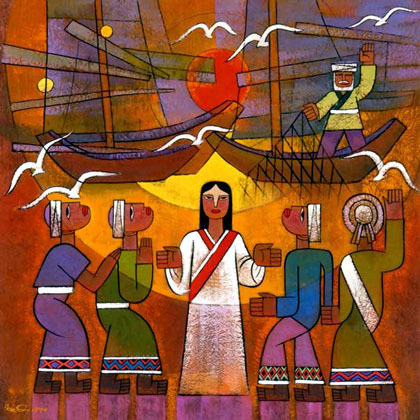 a reblog from friarmusings … calling disciples …From the beginning of Matthew’s narrative up through the “temptation” in the dessert (4:1-11) we have been introduced to Jesus of Nazareth, Israel’s Messiah and Son of God. A rich profusion of scriptural quotations and allusions has traced a variety of prophetic themes and connection, which as a whole, point to the coming of Jesus as the time of fulfillment of God’s desire and hopes for his people. Jesus has been marked as the one who will carry the work announced by John the Baptist into the era of judgment and salvation promised from of old by God. It is here in our gospel reading that the stage is now set for the public ministry of Jesus to begin in earnest. Following the arrest of John the Baptist, Jesus begins his own ministry in the territory of Zebulun and Naphtali, in the region of Capernaum.